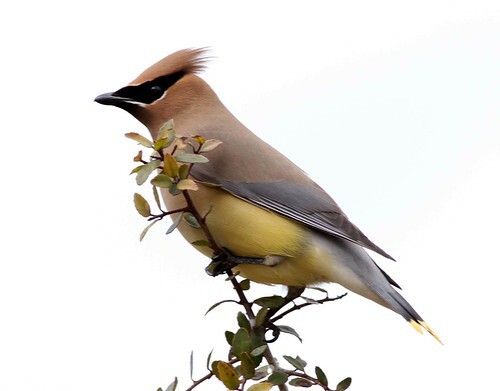 Cool Facts about Cedar Waxwings in Waxwings, Did You Know...? Cedar Waxwings are named for the waxy red tips on the end of their secondary feathers. The number of wax tips and their size increase as the bird gets older. Cedar Waxwings LOVE fruit. They can even survive on fruit alone for several months! Brown-headed Cowbirds hatched from eggs that were dropped in a Waxwing nest typically don't survive because they are unable to grow on such a high fruit diet. Waxwings can get drunk from eating overripe berries that have started to ferment and produce alcohol! 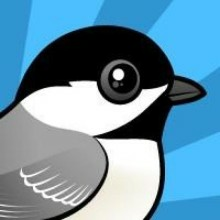 Flocks of intoxicated birds have been known to simultaneously hit large windows. 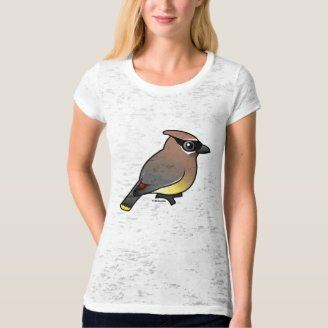 Cedar Waxwings don't have a real song. Instead they make a quiet trilling or buzzing sound. 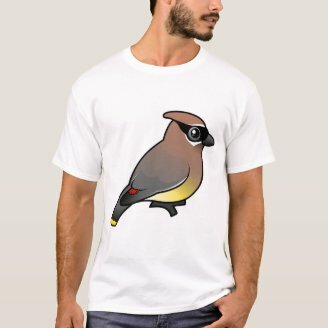 The tail of Cedar Waxwings usually has a yellow band at the end, but in the 1960s birds with orange bands started to show up in the northeastern United States. The orange color is a result from red pigment found in non-native honeysuckle fruits introduced to their diet. They eat in shifts. One group will eat first and then moves out of the way for the next group to come in. 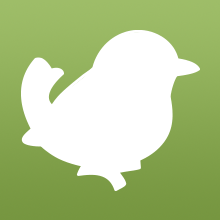 This is very polite compared to most birds, who just try to grab what they can individually. A group of waxwings is called an "ear-full" or a "museum" of waxwings. 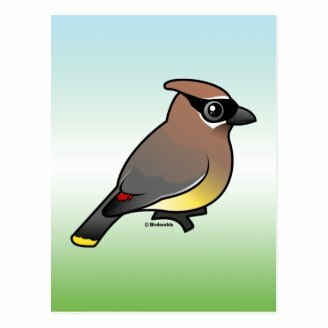 The Cedar Waxwing has been a Birdorable since September 2006. 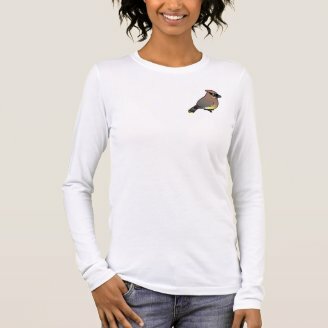 Check out our cute waxwing t-shirts and gifts. 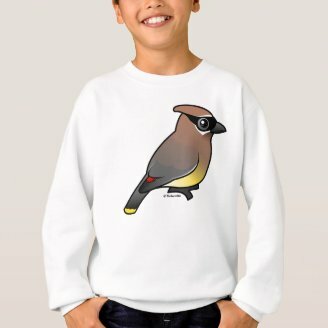 10 comments on "Cool Facts about Cedar Waxwings"
Hey I just wanted to let you guys know that on of your words is spelled wrong. The word is "simultaneously" but you guys have it up there as "simultanously". So yeah thats all I wanted to say. HAve a great day and your website is awesome! 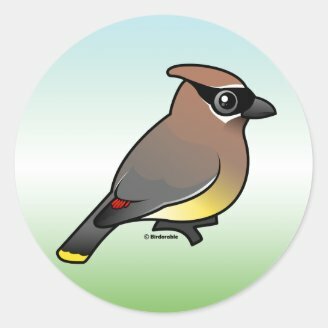 I am doing a project on Cedar Waxwings and this was very helpful! 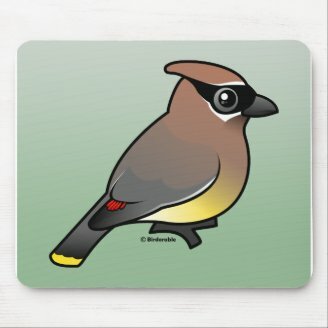 The cedar waxwing is one of my favorite birds, thank you for the insightful facts. This was a very helpfull sight! why is a group of waxwings called a library?